The final prewar crisis was caused by the fatal shooting of Archduke Francis Ferdinand, heir to the Austrian throne, at Sarajevo (Bosnia) on 28 June 1914. The assassin, Gavrilo Princip, was a Bosnian not a Serb – although he had at­tended Belgrade University. His accomplice, Cabrinovic, was undeniably Serbian. Both were arrested and sentenced to 20 years’ penal servitude. The repercussions of their crime would cost the lives of at least 9,700,000 combatants and perhaps 10 million civilians (including deaths from genocide, starvation and influenza). Austria declared war on Serbia on 28 July 1914. When Russia mobilized, as a demonstration of solidarity with fellow Slavs, Germany declared war on Russia and France. German armies invaded neutral Belgium to outflank France’s border fortresses. This flouting of a solemn treaty (Treaty of London 1839) and international law obliged Britain to declare war on Germany (4 August 1914). She made preparations to dispatch a small (two corps), but highly professional, expeditionary force to France. People everywhere welcomed the outbreak of the war. 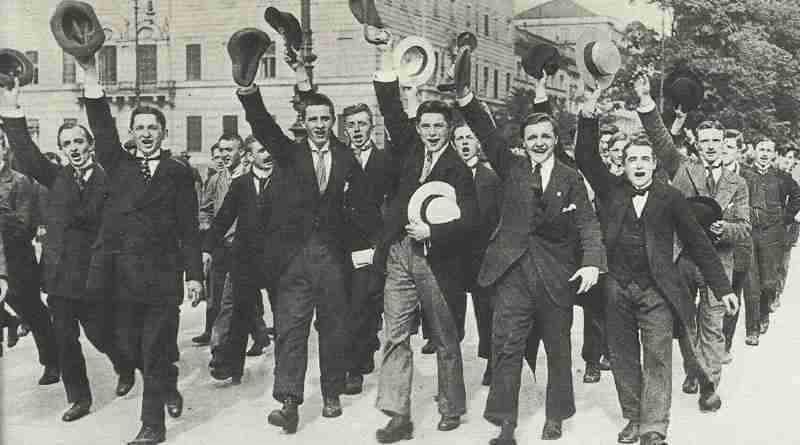 These young Berliners have been called up to serve in the German Army. France was determined to pursue her long-cherished war of revenge against Germany and her army was wedded to a philosophy of l’ offensive a l’ outrance (all-out offensive). C-in-­C Joffre’s ‘Plan XVII‘ envisaged an invasion of Alsace-­Lorraine followed by an advance to the Rhine. It almost entirely neglected to take prudent steps to meet any other contingency than a sweeping French victory. The result was that, when the German Chief of Staff, Moltke, implemented the so-called ‘Schlieffen Plan’ (that of his 1891-1905 prede­cessor) for a vast scything advance through Belgium and northern France, designed to trap the French armies, it came close to success. Only the mistakes and moral inade­quacy of Moltke (a sick man) paralleled by the iron nerve, adaptability and organizational genius of Joffre and the Paris garrison commandant, Gallieni, saved France and the Allied cause in the First Battle of the Marne (September 1914). 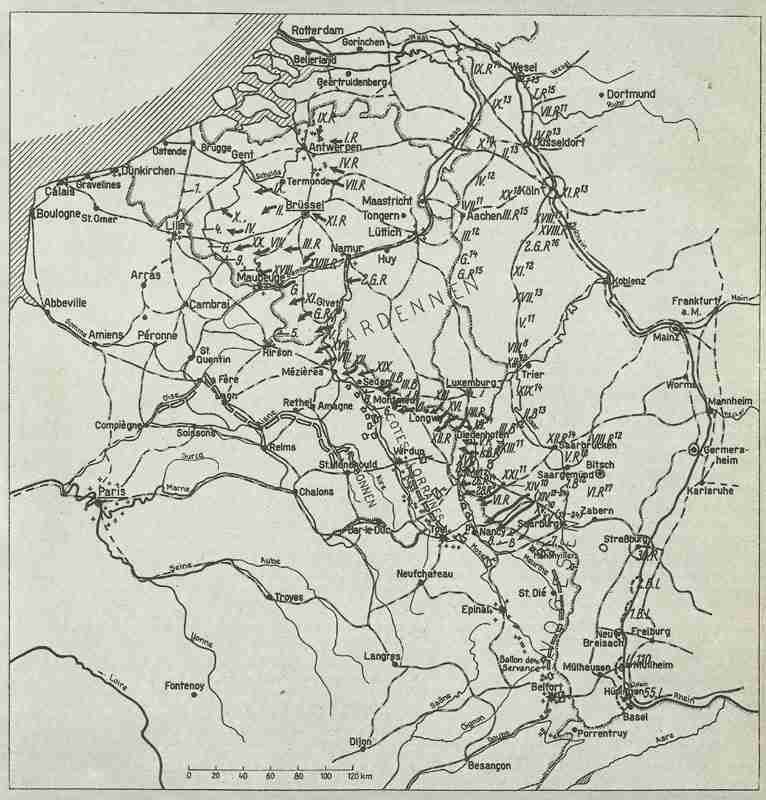 The original operation map of the Schlieffen Plan. The Belgian Army, belatedly joined by British rein­forcements, made a defiant stand at Antwerp. In early October, the Belgians retreated down the Channel coast. By 15 October 1914, the continuous entrenched Western Front had been established from the sea to Switzerland. Furious German attempts to break through at Arras and Ypres were conspicuously unsuccessful. Hindenburg and Ludendorff at Tannenberg, while in the back Russian PoWs marching in captivity. 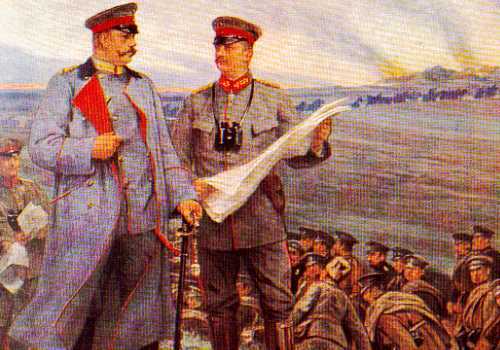 Two big Russian armies – gallantly but very ineptly lead and poorly equipped – immediately lurched into East Prussia. Although ultimately disastrous, their misguided onslaught did serve to force the Germans to withdraw forces from the West at a critical time. Hindenburg crushed the Russians at Tannenberg (late August 1914). A Russian invasion of Galicia (Austrian-ruled Poland) proved less easy to contain, being blocked a few miles east of-Cracow. Despite the massive potential threat posed to Britain’s traditional naval supremacy by the German Navy, the latter remained in harbour. Commerce raiders, U-boats and minelayers made some mischief but the formidable German Pacific Squadron (von Spee) was bloody annihilated off the Falklands by British battlecruisers in early December 1914. Shortly afterwards came that strange interlude, the ‘Christmas Truce’ on the Western Front, when spontaneous outbreaks of fraternization took place between British and German (particularly Bavarian) troops. For a ‘brief shining moment’ (to use one later and borrowed phrase but per­haps apposite here), a hell-bent, war-crazed continent teetered on the edge of the sulphurous abyss.